Police are appealing for witnesses after a young man was left badly injured in a crash while driving an off-road farm vehicle at the weekend. The 28-year-old man, who is believed to work at Hillhead Farm, near Oldmeldrum, was hurt following a collision between a car and an all-terrain vehicle on Saturday afternoon. Motorists pulled over to help the casualty using first-aid techniques while other passers-by helped shelter them from the wintry weather. Emergency services rushed to the scene on the A947 Oldmeldrum to Fyvie road at Hillhead of Tulloch at about 3.30pm. A police spokesman described the farm worker’s injuries as “potentially serious”. The collision involved a blue Vauxhall Vectra and an orange Kubota All-Terrain vehicle. The 34-year-old male driver of the Vectra was not injured. The road was closed for several hours while police carried out investigations at the scene and diversions were put in place. A passing motorist, who did not want to be named, told how she stopped to help the injured driver and described the situation as “tough”. She said: “I stopped along with some other people and we tried to make him as comfortable as possible – I didn’t get their names, but what an amazing job they did. The casualty, who is believed to work at the Simmers (Ardmedden) Limited owned Hillhead Farm, was transferred to Aberdeen Royal Infirmary following the crash. One resident who lives nearby and did not wish to be named, described the stretch of road as “extremely treacherous” and said it was sadly “not a rare occurrence” for accidents to happen there. Council leader Jim Gifford agreed and last night said a lack of funding was preventing the council from introducing more safety measures. He said: “I’m not sure that speed limits would solve the problem at that location – most accidents here are caused by people using one of the few overtaking straights that are available to them on this road. “We have a route strategy worked up for the A947 and have implemented some parts of the work required to aid safety along the route. “We do not have the money required to do everything that we would like to do and do need help from the Scottish Government in order to do that more quickly. “Our thoughts are with everyone involved. And ward councillor Karen Adam said: “My first thoughts are with those involved in the accident and their loved ones at such a devastating time. “I cannot comment on the specifics of this accident as the police are continuing their investigations but I do commend our emergency services for their hard work and care. 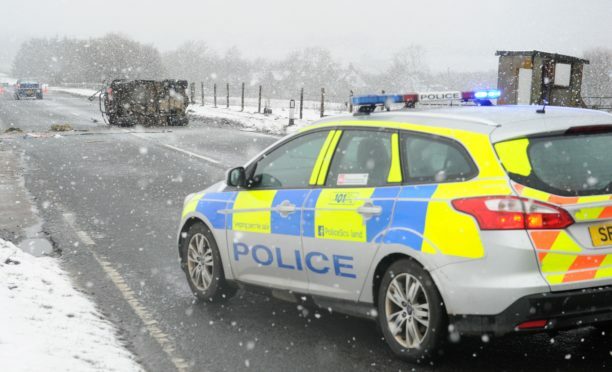 “Safety improvements along the A947 are desperately needed, they have been identified and discussed within meetings of the A947 member officer working group. The road reopened just before midnight on Saturday. Last night police appealed for witnesses to the crash.